WNIU 90.5 FM is pleased to present the world-renowned Avalon String Quartet. 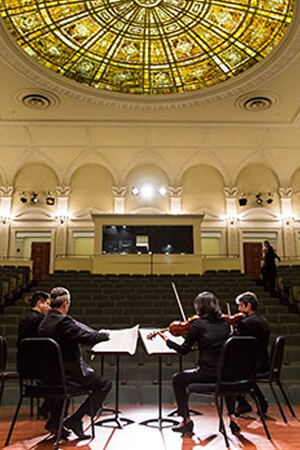 Quartet-in-residence at Northern Illinois University School of Music, Avalon has established itself as one of the country’s leading chamber music ensembles. WNIU is proud to feature the Avalon String Quartet from NIU’s Boutell Memorial Concert Hall on Monday, Feb. 20. This broadcast is presented as part of “Encore,” a local program dedicated to showcasing regional musicians. Hosted by Eric Hradecky, “Encore” pairs musical performances with interviews with the artists. The Feb. 20 episode of the program will feature an interview with Anthony Devroye, viola, and Avalon’s performance of the Matthew Quayle String Quartet No. 3, marking the third time this season Encore presents a world-premiere broadcast. The concert also includes the String Quartet No. 14 in D minor, known as Death and the Maiden, by Franz Schubert, all recorded by recent Grammy winner Dan Nichols, head of the university’s recording services. Consult the “Encore” schedule and all programming on WNIU at wniu.org. Like WNIU on Facebook and follow it on Twitter for related interactive content and for frequent reminders about when to tune in for special programming.